A West Coast friend recently asked me for some dining destinations in town, and he was confused when Unideli, a noodle bar in a grocery store, popped up in the first five names. Sure, that might seem objectively strange, but only if you haven’t tasted through their unimpeachable selection of noodle and rice bowls. If you have, the reasons are obvious and numerous: Ramen Mondays and SPAM musubi, stone bowl bibimbap and slices of Chinese BBQ char siu pork to nibble on while your noodles come together. 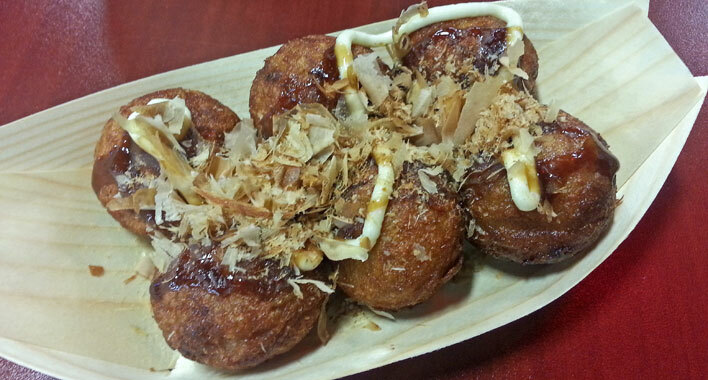 But the takoyaki ($5) may be the finest way to start a meal at Unideli. They’re golf ball-sized drops of batter, fried in a pan equipped with a number of individual wells. They’re kind of like a savory version of the aebleskiver your Dutch grandmother used to make. The batter contains some octopus (tako) and the chewy tentacles make for a fine textural contrast inside the soft and yielding snack. The little octo-balls come six to an order, topped with japanese mayo, takoyaki sauce (savory, Worcestershire-like), and a dusting of fish flakes (katsuobushi – those dried bonito shavings that give flavor to dashi). The flakes dissolve on your tongue, delivering most of the seafood flavor. The exteriors are slightly crisp. Inside, they’re creamy, hot and soul satisfying. Be sure to let them sit for just a second – they’ll arrive at your table screaming hot. While you wait, finish the rest of your char siu, and scan the aisles for the ridiculous candies you’ll bring back to the office (I found green tea Kit Kats!). Unideli at United Noodles, 2015 E. 24th St., Minneapolis, 55404. 612.721.6677.